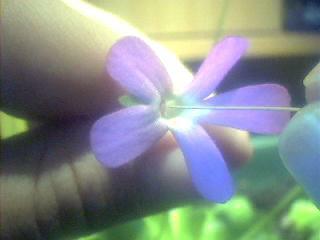 Petals (making the corolla) are easily visible on all Pinguicula flowers. On one side of their attachment to the flower stem they are fused into a spur of variable length which may, or may not, make an angle with the rest of the flower and which can be pointed of sack-shaped. On the other side of the stem, they form five lobes which can be of equal or different in length and shape. Spur and lobes are linked by a tube (cylindrical or funnel-shaped) of variable length depending on the species. 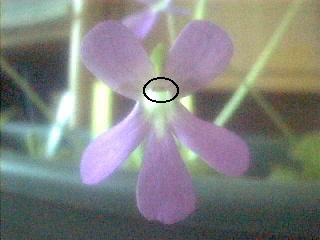 At the point of attachment of the corolla to the flower stem, 5 green sepals can be found. They are smaller than the corolla but are easily visible once the corolla has fallen off. The reproductive organs (anthers, ovaries, stigma) can be found inside the corolla below its point of attachment to the flower stem. Because most Pinguicula flowers are hanging below their stem, these organs are found on the upper part of the flower, below the upper petal lobes at the entrance of the flower throat. If the flower tube is too long, they may not be visible. To access them, it may be necessary to tear the petals apart. For this, hold the upper lobes in one hand and the lower ones in the other before pulling them apart. This will lead to the removal of the lower half the corolla and will make the anthers and stigma easily accessible. 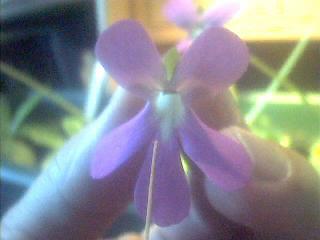 Pinguicula flowers have 5 anthers, 3 degenerate ones that are non-functional and can only be seen with a microscope and 2 large ones that are functional. The 3 dead ones are facing the outside of the flower while the 2 live ones are facing the inside and are, therefore, not visible unless the lower part of the corolla is removed (see above for protocol). The live anthers are made of a short and fat stem (called filament) that carries a large sack containing the pollen grains. The stigma is carried by an inconspicuous stem and is usually 2-lipped. It contains a tiny (often invisible with the naked eye, but sometimes visible as a small dot) flat lip that faces upward and one large lip that faces downwards. It is easily visible with often a distinctive colour and some shininess. It is tongue-shaped and obstructs a large part of the flower throat. 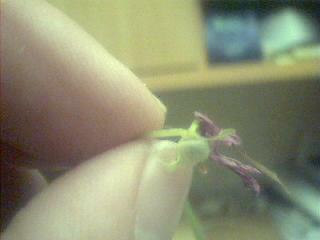 The anthers are located just behind this large lip. Since the outward facing surface of the stigma is the only one to be receptive to pollen grains, auto-pollination will not occur unless pollen grains are moved from one side of the stigma lip to the other one. 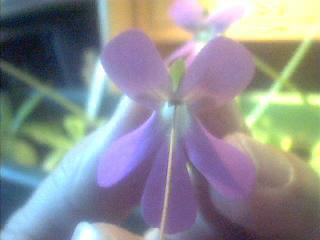 Pinguicula pollen is not normally carried by the wind and pollination has to be facilitated by insects. Self-pollination is a rare phenomenon that only concerns flowers that are too small for pollinators to visit such as the ones of P. villosa. In this case, the anther filaments elongate and hook back to deposit the pollen sacks on the right stigma surface. P. lusitanica flowers are also capable of self-pollination. 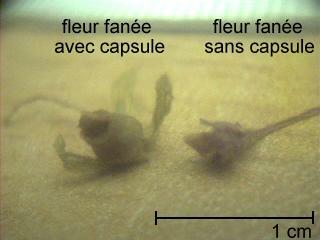 A similar mechanism is activated when flowers are several says old and no pollinator has payed them a visit. Flowers will remain open and fertile for 3 to 10 days and sometimes more if temperatures are cool enough so that there is no rush to pollinate them on their first day of opening. Because pollen grains escape from their sack by a small opening that naturally develops once the flower is mature, it is actually advisable to wait until flowers are 2 days old before pollinating them. The use of a sharp instrument to collect the pollen is also advisable because it helps in the breakage of the anther’s membrane and the release of the pollen grains it contains. Personally, I use a wood toothpick. They can be used as such or flattened and sharpened on one end with a blade to fit the size of the stigma lip. This will allow more pollen to be collected and inflict less damage to the flower structures. As stated above, the corolla needs to be split into 2 parts if its tube is too long and does not allow the stigma to be visible. One easy way to carry the pollination is to hold the flower with one hand at its point of attachment to the corolla (this will open the corolla slightly as for snapdragons). The other hand holds the toothpick and passes it behind the stigma lip to collect the pollen (should be visible on the toothpick) to later deposit it on the stigma. If one big ball of pollen has been collected, it is good to spread it around on the stigma surface. Pinguicula capsules can accommodate many seeds (up to 100) and more seeds will be obtained if more pollen grains are given the opportunity to germinate. If there is little pollen, it is best to deposit it at the point of attachment of the 2 stigma lips, on the upper part of the big one, close to its attachment to the rest of the flower. This process of pollination, only needs to be carried out once and it is actually better not mess around too much with the toothpick. If pollination has succeeded, the corolla will dry up and fall in a couple days. 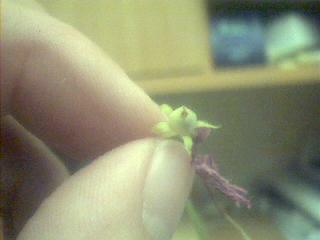 Then, the ovary will develop as a more or less round ball inserted on top of the sepals and capped by the dead stigma. Seeds will take 1-2 months to mature. They are ready for harvest when the sepals, seed capsule envelop and upper part of the stem turn brown. 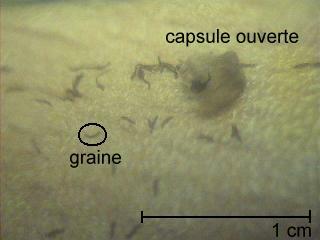 But don’t wait too long to collect the seeds since, one day after browning, the capsule will split open and let the seeds fall. There are several reasons why pollination may not succeed and they are not all well understood. A reproduction barrier may exist between the 2 species. 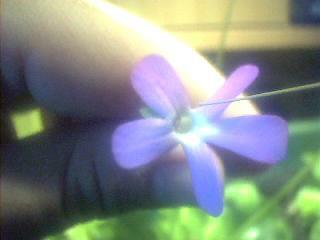 These do exist like between P. alpina and P. vulgaris in Europe or between European and Mexican Pinguicula. However, most Mexican/Cuban species hybridise with each other like European one, a process that may very well happen in nature. One of your partners may be infertile. This has developed on several Mexican species that have been in cultivation for too long. The origin of this lack of fertility is unknown and may stem from past mass in vitro cultivation with the use of synthetic hormones. In this case, male and female parts may not be un-functional at the same time so that your plant may still be receptive to the pollen of another species or yield viable pollen while being auto-infertile. One classic example is made by P. esseriana and P. ehlersiae which are non auto-fertile in European collections. However, the 2 can be crossed successfully when the cross is carried in one direction only!